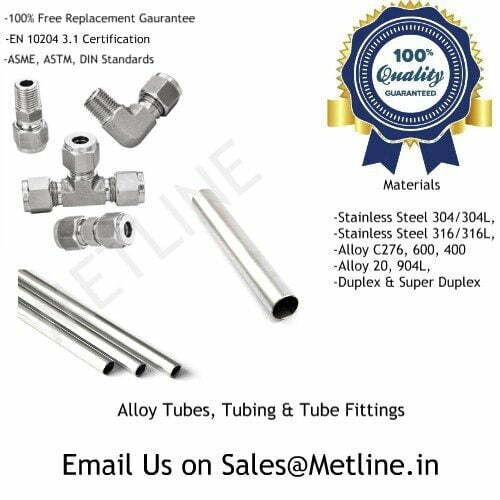 Metline is a leading manufacturer and supplier of Inconel alloy 600 tube fittings, also widely known as compression or instrumentation fittings in India and worldwide. With 72% minimum nickel, Inconel 600 tube fittings are highly resistant -to many organic and inorganic compounds and provides good resistance in reducing conditions. UNS N06600 or W.Nr. 2.4816, Inconel 600, also known as Alloy 600, is a nickel-chromium-iron alloy with good oxidation resistance at high temperatures and resistance to chloride ion stress-corrosion cracking, corrosion by high-purity water, and caustic corrosion. It is mainly used for furnace components, in pulp & paper manufacturing, chemical and food processing, in nuclear engineering, and for sparking electrodes. Metline Industries is known as one of the leading Inconel Alloy 600 Tube Fittings manufacturers and suppliers in India and worldwide. We produce the best quality nickel alloy tubing, tube fittings and pipes with high precision and good performance. We look forward to offer you best prices for Alloy 600 tube fittings from stock and make to order. Trademark Notice: Some names are trade names and/or trademarks of specific manufacturers. Metline Industries is not affiliated with any manufacturer(s). Orders will be filled to meet specifications from any available source(s). Names are listed solely for reference to help identify products consistent with listed specifications. Form Tensile Min. 0.2% Yield Min. Elongation Min.